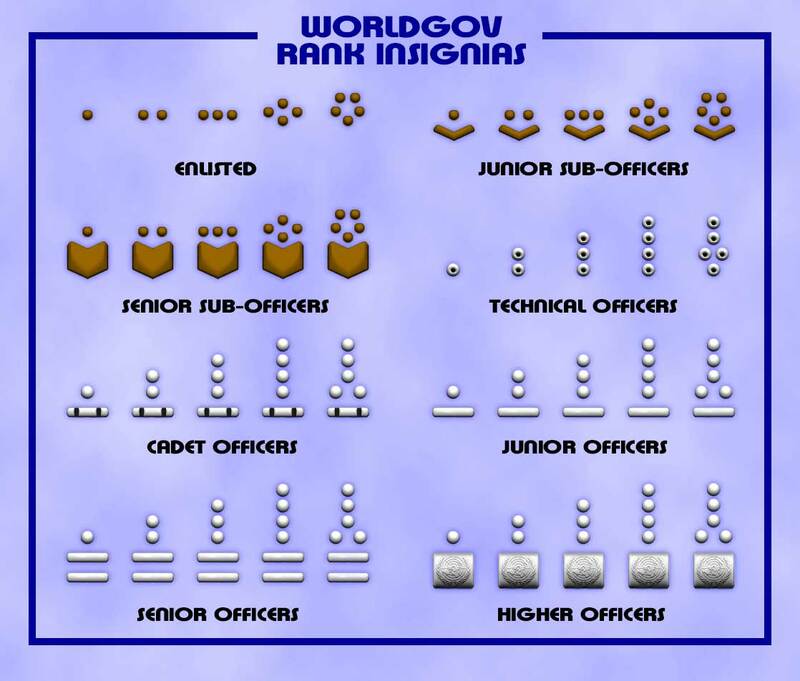 Long time ago, I, as Cyberwarrior (I've lost access to that account) created a topic here where I asked what would ranks and insignia for the armed forces in a world government would look like. Apparently, the topic was deleted, as I linked images from imageshack.us in a way which no longer works. I made some sketches and our own Medic_in_Uniform came up with some awesome versions of those insignia, which I thought it was a good idea to make available at this forum again. Wow...! Hey, I remember those -- Flashback!! When I first created the original thread, someone (I don't remember who) said that Senior Enlisted Advisors (SEAs) were a very US thing, so I dropped those positions from my original chart. But it looks like, since then, an increasing number of forces worldwide have imported the idea from them (on Wikipedia alone, I already found 7 countries other than the US which have those positions: Australia, Canada, Denmark, New Zealand, Singapore, South Africa and United Kingdom), so I decided to recreate the positions for WG armed forces. The insignia for SEAs consists on the same as E-7, with the UN emblem above it. Like today's armed forces, there will be one SEA per force. I made a separate chart for SEAs so that the chart provided by Medic would not grow too much in size. Seems fair enough to me! It was quite a few years ago but, if I remember correctly, the concept was that as this was effectively starting from scratch, the patterns of the uniforms wold be based on the same generic design but with differing base colours for each service and rank markings could be standardised for instant recognition across all the branches of the services. You know, if I was to take another pass at those now, I'm sure I'd do something slightly different -- although it would definitely be one of those things where I'm not sure exactly *what* it would be, and it would evolve as I started drawing and working it out as I went along...! The insignias look good but to me the system looks visually and its application too much like some sort of US-canadian joint organisation. A world system to me would be one that is modular as it would originally have had to allow for national armed forces with various number of ranks not only overall but at each level. technical officer: specialised officer without command power outside its speciality. so originally personnel would have been given a rank equivalent to 1-5 scale (or more) so that every ranks would have been represented and as a further development, some ranks would have ceased to exist over time due to attrition. Just one point: how d'you think the Muslims, Hindus, Jews, Buddhists, etc would react to wearing a cross? Or the Christians to wearing an inverted cross? The four and five-dots ranks perhaps would do better with a circular or diamond-shaped arrangement... wouldn't you say? Miklós Lovász wrote: Great work, Mark! didn't think about that (being an atheist) but that's a fair point. Wow! Marc, you did a nice job making a new set of insignia that actually breaks tradition. This would suit a global force very well. I picked the uniforms I posted before and repainted them to use the colors proposed by Medic at the images on the opening of the thread. I only allowed myself to do that because the uniforms drawn by JJohnson1701 are non-canonical. And these are the ranks for Marines. There are two Marine Corps in the planned world gov't: Naval Marines, which will work as "soldiers afloat" like the Marine Corps we have today, and the Space Marines, which will work the same way, but in space. Stars may be replaced by the emblems of the individual services. I followed Helios88's suggestion and here's what I've got. And these are the new ranks for Marines. I think in this way services retain their pattern uniformity, but at the same time also retain a certain degree of individuality. And these are the new insignia for Marines. Oh, I was forgetting the Medical Service (mentioned at the beginning of this thread). It's a fifth branch of Earth Armed Forces (seventh, if you count the Naval Marines and Space Marines as separate entities from the Navy and Space Fleet, respectively), which is responsible for every health-related aspect in the Armed Forces. In its ranks we have doctors, dentists, pharmacists, nurses, paramedics, combat medics, ambulance drivers, etc. among other health professionals. Ranks up to Captain use the Army system, don't they? Another thing we were talking about on the original thread was about the police force. The force I'm envisioning would be a single police force, organized much like a gendarmerie, with powers to arrest people anywhere (in flagrant or with a warrant, of course), conduct investigations and perform patrol duties, among other duties related to law enforcement. I made their insignia silver on blue (a different shade of blue than those of Air Force and Navy), and for service emblem I chose an 8-pointed star (the first design I made featured a 6-pointed star, but then I realized that it would be too easy to associate with Israel or Jews, which would make many people frown upon it). Helios88, you've got a point, here. I've changed the ranks to military ones, so that the police force would be known as the sixth uniformed service (eighth, if you count the Naval and Space Marines as separate entities from their parent services). Re Constabulary/Gendarmerie: if it has military police duties (like France's Gendarmerie), then military ranks are appropriate (but see below). However, famous English-language gendarmeries (the Royal Irish Constabulary, the Royal Canadian Mounted Police, the British South African Police) used police-type ranks. You could argue that if the Constabulary is a parallel service it can have its unique style of rank titles even if it does have military police functions. jrichardn2 wrote: Re Constabulary/Gendarmerie: if it has military police duties (like France's Gendarmerie), then military ranks are appropriate (but see below). However, famous English-language gendarmeries (the Royal Irish Constabulary, the Royal Canadian Mounted Police, the British South African Police) used police-type ranks. Spanish Guardia Civil, Romanian Jandarmeria, Chinese Peopole's Armed Police, State Military Police forces in Brazil, Portoguese National Republican Guard are all military corps, without provost duties and with military-stile rank titles. It is up to Lord Cybran: only he may decide the exact nature of the law enforcement agency/agencies. However some police forces retain rank insignia closely related to military rank insignia. Of course it all depends on your definition of military v. paramilitary. The BSAP in the Bush War certainly had military functions, and had some clearly military formations. Even today the RCMP is (proudly) characterized as a "regiment of dragoons", and was somewhat militarized during WWII. I don't really disagree with using military rank titles. Just saying that police-type rank titles (at least in an English-speaking context) wouldn't stop a gendarmerie from being, well, a gendarmerie or corps of provosts. After reading recent Helios88 and jrichardn2' recent replies, I came to the conclusion I must read more about gendarmeries, corps of provosts and the organization of police forces before coming up with rank structure and insignia for an Earth Police Force. For now, I just thought changing the two most junior ranks in the force to "Policeman". I think this fits better a gendarmerie. These are the insignia for officer cadets. Hey Helios88 - glad you liked it! Now that I mentioned police force, I'm thinking about firefighters. Should we have local firefighter corps on each town, like in the US, or should we have a big, global one? I've made a new set of insignia based on the others I'd already made, assuming that we have a big, global, military-like organized Firefighter Corps. This would be responsible not only for fighting fires, but for conducting every kind of rescue operations, on land, sea and perhaps even space. For the emblem of the Corps, I chose a version of the Maltese cross often used as emblem for fire departments. I made the shoulder boards red, but I'm thinking on putting them on blue uniforms - of the same shade as police uniforms.